Roger the Phone Guy | So… You're in charge of the phones now! Hello Everyone! I’m excited to say I got my hands on an unofficial “SigMa Cookbook” from a buddy of mine at Avaya. This was put together by some engineers at Sipera. This was passed around within Avaya and maybe some customers, but I don’t think it was officially released. These recipes were put together in 2010 and 2011 for “generic release 4.0.4 Q102 or later”. I do not think there’s official support for this. It was an internal document and was always sent with various warnings about “your mileage will vary”. So you have been warned! If you find any errors and clean up some of these, please let me know and I’ll fix them here. I have formatted it as HTML for easy searching. I do not know if the engineers want me to include their names. If any of you are from Avaya or Sipera and want attribution for these recipes, please let me know and I’m happy to do it! And also let me know if you have any good examples we should add. There’s not much of a user community for these SBCs so let’s help each other! The P-Asserted-Identity header field can be used to present the identity of the originator of a request within a trusted network. Since the “From” header field is populated by the originating User-Agent it may not contain the actual identity. It usually is established by means of authentication between the originating User-Agent and its outgoing proxy. The outgoing proxy then adds a P-Asserted-Identity header field to assert the identity of the originator to other proxies. If there is no P-Asserted-Identity header field present, a proxy MAY add one containing at most one SIP or SIPS URI, and at most one tel URL. If the proxy received the message from an element that it does NOT trust and if there is a P-Asserted-Identity header present, the proxy MUST replace the SIP URI or remove it. i.e. the destination of the message should be Uc-Sec (%DIRECTION="INBOUND"). Checks if the first P-Asserted-Identity header is present/exists in the message. Each header is represented as %HEADERS["<Header-name>"][<Header position>]. For headers such as From and Contact, the Header Position is always 1. Add a SIP and a telephone URI. If both the above conditions are successful, as soon as the message comes from the wire, (and after the basic sanity checks and DoS checks are performed on the message), the action is performed. The script checks to see if a “P-Asserted-Identity” header exists. If it does, it removes it, else it adds the header. If you would like to remove all the P-Asserted-Identity headers, it is assumed that you know the maximum number of headers that would be present in the messages. You do not need to know the exact number of headers that come in because if you perform an operation on a header that does not exist, it is simply ignored. will add the header to the message. It might be required to add/modify SDP attributes or connection parameters for interoperability. The "m=" field in SDP contains information about the type of media session. It includes the format-list parameter for specifying the codecs. The "a=" field contains attributes to provide more information on the codecs. The script looks into all the messages of the “INVITE” session. A session is defined as a SIP dialog and has the same lifetime as that of a dialog. A new format-type and an attribute is added corresponding to fmtp. We would need to know the number of codecs (number of formats in format-list parameter and attributes), or we would end up replacing an existing format-type. Checks if the privacy header value matches with the regular expression given (e.g. "none"). If it matches, then the privacy header value is changed to "id"
In an organization, there could be several phones used by the employees and each of them might have a unique “From URI” associated with them. It may be required that all calls going out from the organization have the same “From URI”. For this purpose, the following script can be used. URI.USER extracts the user portion of the URI. regex_match tries to match the string against the regular expression. The display name and uri is changed to the new values. When the response comes back, we need to change the URI USER and DISPLAY NAME to the actual user. So,before the message is sent out to the wire from the Uc-Sec, it is checked if the URI.USER is 9000. If yes, then change it back to the original user's details. The above example shows how to modify a message (request) on its way out and also modify a message (response) when it comes in. The example illustrates the use of regex_match. The regular expression provided within the parentheses, i.e. regex_match(<regular expression>), can be any valid Perl regular expression. However, the “$” symbol (which typically anchors the match to the end of the pattern) cannot be used in the regular expression. The Allow header is used to indicate the methods supported by the user agent, e.g. “Allow: INVITE, ACK, BYE, INFO, OPTIONS, CANCEL”. The OPTIONS method is used to query a user agent or server about its capabilities and discover its current availability. The response to the request lists the capabilities of the user agent or server. This may not be desired (probably due to security reasons). In this case, the Uc-Sec can strip the OPTIONS method from the Allow header before sending out the message. There could be (1) multiple methods in Allow or (2) OPTIONS could be the only method in Allow. So, we try to match Allow against the regex ",OPTIONS"
and make sure you match it in this script! an empty string, indirectly removing ",OPTIONS"
but I think that is incorrect so I removed it for this example. I do not have an SBC at the moment though - please check your traces! We replace OPTIONS, with an empty string, indirectly removing " OPTIONS,"
Allow: OPTIONS. So, we try to match Allow against the regex " OPTIONS"
The above script can come in handy while operating on headers such as Allow, Supported, Content-Type etc, whose values can’t be extracted individually as compared to headers like “From”, “To”, or “Contact”. The regular expression in regex_replace can’t have the $ symbol. Phone numbers may come in with a prefix. Sometimes this needs to be stripped off before the call is routed. This is useful in scenarios where a call transfer is made and the number to which the call has to be transferred is entered with a prefix. match the regex, then the action is ignored and the message is left intact. The messages which have the “Refer-To” method are checked if the URI contains a prefix. If so, it is stripped before sending it out. The user may want the option to add a diversion header or manipulate the extension field or change the URI parameters in the header. This example also illustrates combining two functions such as addition of a diversion header only to the INVITE and the removal of phone-context from all outbound messages. The user may require to populate the From header in the outbound INVITE message with the contents of the Diversion header in the incoming INVITE. The user may require manipulation of the contents of the xml body present in the INVITE message. The user may require to switch tags on the From and To in a particular message. The following example illustrates tag switching in the 200 OK message. Note from Roger: Does anyone know why you’d want to swap the from and to? This was the 10th example in the doc but I cannot think of why this would be useful. This entry was posted in Avaya, Avaya Stuff You Should Know on January 28, 2019 by roger. I was recently contacted by an old client who is moving offices. They have four-digit dialing between offices and use a lot of h.323 tie lines. However, they’re migrating to Cisco and during the transition, they just want to convert four digits to a PSTN call. Most of our telephone systems probably do this, but we rarely need to change it or add new ones, so I figured I’d summarize the process here. Typically, four-digit translation is done based upon the first two digits (i.e. 100 numbers at-a-time). There are really only a few steps: Create the entry in the “dialplan analysis”, then the “uniform-dialplan”, then the “aar digit-conversion”. It is possible to perform some digit-conversion in the uniform dialplan, but I prefer to use the aar digit-conversion table due to consistency and flexibility. In this example, we add translation for the 83xx range to dial 914-555-83xx. There should no entry for ‘83’ in the “dialplan analysis” table. Create an entry in the uniform dialplan for 83 with a length of 4 and no deleted digits. However, we are going to insert the digits here to route through the PSTN. In this case, insert 1914304. We set the Network to ‘ars’ so that this call goes through ARS routing. Note that we do not include a ‘9’ in the inserted digits. This is because we’re explicitly telling the PBX to use ARS routing (which is also what the ‘9’ does). Also note that you can only insert 10 digits here, which is not enough for some international translations. In that case, I use ars with digit translation. But this is fine for USA numbers. However, to be consistent between a mix of USA and international, I will typically use ARS digit-conversion as described in the next step OPTION 2. This is the most consistent (and my preferred) option, because if you have any translations to international numbers you’ll probably need to use this method. Create an entry in the uniform dialplan for 83 with a length of 4 and no deleted digits. However, we also want to perform digit conversion on this pattern so be sure to stroke the “Conv” column to ‘y’ so additional conversion can take place. Next, create an entry in the aar digit-conversion table for 83. Set the min/max to 4 and insert the new digits in the replacement string. 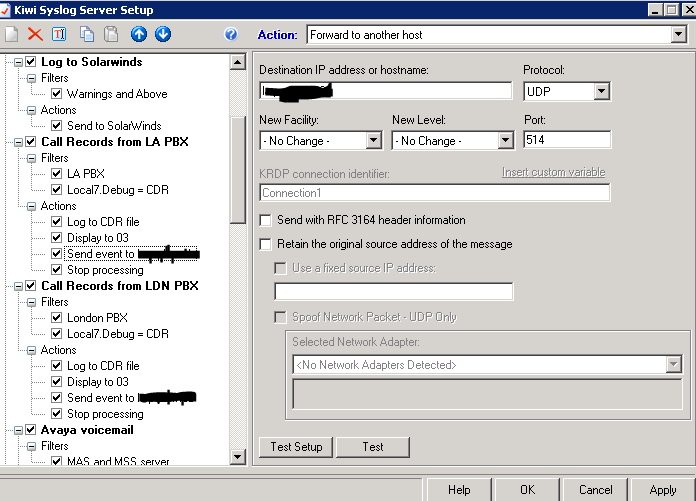 Then set the Net to “ars” to tell the PBX to route the call out to the PSTN. There will be no more digit conversion, so leave Conv to ‘n’. And that’s it! You should be able to dial 83xx and it will use ARS routing to the translated value of 191755583xx. If you have any trouble at all, you can refer to my flowchart of Avaya routing to help troubleshoot this. This entry was posted in Avaya, Avaya Stuff You Should Know on August 13, 2018 by roger. This is a continuation of our discussion about pushing Avaya Communication Manager data into a database so you can analyze the results. In this part, we push the data into a MySql database. The first step is to create the database. I typically use my own Linux workstation. You can ask your VM team for one. They take almost no resources and they’re open-source, so there are no licensing concerns. Therefore I typically have complete control of the repositories, database, and Apache instance. If you do not have the root password to your Linux workstation, then you might need help from your team with some of these steps. We need to start with some assumptions here. So let’s assume you have followed parts 1 and 2 of this series and you have MySQL installed, okay? Now let’s create the tables we need. I always have a “drop table if exists” statement so I can tweak the table as much as I want and re-create it. This creates a keyvalues table and a display name table. Now we have a database and the empty tables we need. Since you have read part 1 and part 2 of this process, you should have a perl script generating your ‘keyvalue.txt’ file. Starting in line 90, It cycles through the keyvalues file and checks for records where the value has changed (line 97). It marks these as ‘changed’ and then inserts the new record. It marks the unchanged records as ‘unchanged’ (line 104). Lastly, any record that was not touched through this loop is NOT in the text file. Does that make sense? So any record that is still marked ‘old’ in step 1 must have been deleted from the Avaya system. So we mark these records as ‘deleted’ (line 125). When this script is done, we have a list of all active records in the database. We also have a list of old values and deleted values. This gives you a rolling history of all extensions in your database. I cannot tell you how handy it is to see a history of an extension. You can see when the IP address changes, when registration changes, when firmware changes, network region, etc. And of course when a station is deleted you still have a record of it. This is very handy. For those of you interested in Perl, there are also a bunch of helpful database functions in here. I keep these in my back pocket and often copy/paste them to the next project. At the end of this shell script, you should have a fresh copy of all stations in your PBX in the database! Ready for reading with a simple PHP script. That will be next time, and hopefully MUCH sooner than this post. Sorry for the delay. Before I finish, I want to thank you for reading this. I recently “moved” from an Avaya environment to a Cisco environment, so I don’t have easy access to the Avaya environment anymore. I am using some copies of the scripts so if you find any syntax errors or something doesn’t work, please let me know and we’ll get it working. Once I finish this series, I’ll show you a way to AUTOMATICALLY generate labels for the 96xx phones. That’s the most exciting thing I’ve been wanting to share with you! This entry was posted in Avaya, Avaya Stuff You Should Know on November 7, 2017 by roger. SFB tied to your legacy PBX and legacy voicemail? Aren’t all large SFB installations also connected to an SBC? Anyway, it looks like there are some channel partners willing to help. It’s funny to think of Microsoft’s voice solutions being so old that they’re dropping support of certain architectures. Anyway, here’s the article from Redmond Channel Partners. It looks like a great opportunity for VARs to rekindle the discussions about Microsoft and voice services. I’m not really in this space, but I’d be curious to hear from any of you who are. This entry was posted in Uncategorized on July 25, 2017 by roger. This is a follow-up to my post about extracting data from Avaya Communication Manager. In that post, I showed you how to extract any “list”, “display”, or “status” from Avaya Communication Manager to a text file. First, I would like to show you my bash shell script that extracts this data. And then I’ll show you my perl script that converts the output to a text file that you can open with Excel or import into a database. So those are the various pieces of information that I care about. Looking at that info, those are my active trunk groups, and I want to know the status of four particular extensions (those happen to be the digital ports of my fax server). Also, I have a port network, so I want the status of IPSIs. Anyway, think about all the stuff you care about when you log into your PBX in the morning. And stick them in that “commands.txt” file. I put a “display time” at the beginning and end so I can look at the file later and tell how long it took to run the file. Let’s go over this script line-by-line, okay? The first line creates a variable for the file that will contain the data. There’s a little linux trick to embed a timestamp in the filename. The second line runs the file av.pl that I shared with you in a previous post about this script. It’s magical. I cannot take all the credit, but I have modified it for our purposes. The third line runs a file that parses the output of all the commands. This is a very useful script and I can take full credit for this one. It generates a list of “key/value” pairs to a text file. That -c just means to check the syntax and don’t run it. It hopefully says “syntax okay”. Actually, I’m sorry but you’ll need to edit the file and change line 45 to the path where you want your ‘keyvalues.txt’ file, which will contain all your data. This should use a command line param, but it doesn’t. Sorry. Starting in line 56, we check the raw text file line-by-line looking for the header for each ‘list’ or ‘display’ or ‘status’ section. For example, when we see the text ‘REGISTERED IP STATIONS’, then we know we are expecting to see the result of a ‘list reg’ (by setting our variable of type to 7). Then on line 183 we actually process the registration status of stations. If type=7, then we are in the ‘list reg’ mode and if a line contains registration information for a station, then we capture the data. Each section has some customization, but you’ll notice that (almost) each section performs a ‘set_data’ of the keys and values appropriate for that section. At the end, the trunk group and station summary is generated and the keys are reported alphabetically. The script parses ‘list station’ and assumes all stations are unregistered. The script parses ‘list call-forwarding’ and generates a list of all stations that are call forwarded. At this point, if you ran the bash script, you would have an awesome list of keys and values in a text file called keyvalues.txt. You probably don’t need to know anything about Perl to get this working for you. But if you do know a bit of Perl, you’ll be able to do amazing things with it. This data is useless unless you’re looking at it. In a future post, I will show you how to schedule this script with cron, push the data into a database, read it with a simple ‘web site in a single file’ php script, filter the data (including historical values! ), and get alerts when the values change. And then I have something REALLY amazing to show you! Thanks for reading, everyone! Feel free to contact me at roger@rogerthephoneguy.com or post a comment here. If you need help getting this code working, or you want to tweak it a bit, let me know! This entry was posted in Avaya, Avaya Stuff You Should Know, data, Uncategorized on May 9, 2017 by roger. Anyway, the article is linked below. If you’re inclined, you can go to JollyRogerTelephone.com and subscribe to the service. You will love telemarketer calls when you use my bots. This entry was posted in Uncategorized on February 9, 2017 by roger. Way back in July of 2014, I wrote about how I stopped telemarketing at my house. Little did I know that my efforts to combat and disrupt unsolicited telemarketers would eventually lead to me giving a TEDx talk about it! Some of you may know that, in an effort to stop telemarketing, I created a robot to talk to them. It’s an interesting story and I posted some audio at the beginning of 2016. My story was picked up by Gizmodo on February 1, 2016 and things got really crazy from there. Anyway, Fast forward to November 4, 2016 and I find myself on stage at TEDxNaperville in Illinois speaking in front of about 500 people at a beautiful venue. I’ve never spoken in front of a crowd like that, and it was amazing. Don’t get me wrong – as a phone guy, I love call centers. But as a phone guy I also love the telephone network. The Public Switched Telephone Network has been around for about 140 years and it is crushed under the burden of unsolicited telemarketing. Blocking doesn’t work. Their predictive dialers simply call the next sucker. I think the only solution (short of abandoning the entire network) is the Jolly Roger Telephone Company. Here is me story about how I’m disrupting the scammers, spammers, and crooks, which make up most of the unsolicited telemarketing industry. By the way, this goes for cold callers too. If your business is struggling to handle cold callers (ask your receptionists, Investor Relations team, or any admins for your CxOs) then I also have a solution for you. It’s called a Biz-Bot and it will handle all your pesky cold callers for all your employees. But anyway, here is the talk! This entry was posted in Avaya, JollyRogerTelephone, pbx, Telemarketers, voice on December 12, 2016 by roger. This is a follow-up to my earlier post about setting up CDR processing with Kiwi Syslog Server. In that post, I discuss how to capture the data to a text file. But of course, if we are capturing CDR, we probably want to analyze it, right? So this post is dedicated to capturing the data to a MySQL database. It is not for the faint-of-heart though. It requires a little knowledge of MySQL and willingness to read a tiny bit of perl. I am happy to help you set this up, though. Either via this blog as time allows, or I would love to work for you as an hourly contractor – and I love all things telecom! If you don’t have a Linux server in your network that you can use for your own purposes, I highly recommend one. Any Linux distribution will do, and you probably have a VMWare infrastructure to support it. If you need to justify it, I can help – perhaps even this blog entry will help. Tell your boss you need to perform text analysis of your PBX data. This blog entry assumes you have Linux, but I suppose it will work on Windows with a LAMP stack (but good luck with local firewall rules in Windows). Those statements create the table and a few indexes to speed things up. The indexes for call_hash and deduced_starttime are used when inserting records. The indexes for from_number and to_number are added since these are probably the most common fields to query. Typically, I will add an index for any field that appears in my ‘where’ clause, but I’m no DBA so there are probably better ways to tune it. However, this works fine for me and should for you as well. Can't locate Roger/Wilco.pm in @INC (@INC contains: /usr/local/lib64/perl5 /usr/local/share/perl5 /usr/lib64/perl5/vendor_perl /usr/share/perl5/vendor_perl /usr/lib64/perl5 /usr/share/perl5 .) at syslog.pl line 2. BEGIN failed--compilation aborted at syslog.pl line 2. And that will get you to the CPAN command line where you can install packages. Or whatever other packages you need to install. Note that case matters, and that’s a double colon between the words. When it asks you a yes/no question, say yes. If all goes well, then it should install fine. CPAN installs all dependencies. If you get errors, the most common is you don’t have a c++ compiler on your machine. I never did figure out how to fix that in Windows. In Linux, there are lots of tutorials. With that in mind, here is the Perl script that will catch the CDR forwarded from Kiwi. Be sure to read my comments at the end. ### out to another server. ### not the best way to manage daemons, but we are telephone engineers here, not linux admins, right? You’ll need to replace the database name, username, and password in the “db_open” subroutine. The comments at the top explain how to run it to process files, or to capture syslog live, or even how to run as a daemon. Each CDR line is hashed and included in the record, so don’t worry about processing the CDR files multiple times. It will NOT insert duplicate records. When processing files, the script will delete the file when done. So always copy the CDR files into a separate folder before running this script. I kludged this together from a working Perl script. I removed some identifying information, moved some variables around, and added a bunch of comments. If you get any errors, let me know – it’ll probably be really easy to fix. For any hobbyist Perl developers out there, this script includes some handy database functions that insert records, return rows, and return one record. This script is for information purposes only. Naturally, I don’t provide any warranties, guarantees, or assertions that it will work with your systems. Run it at your own risk. If you’d like me to help set this up, I’d love to work for you. I love telecom and I’m always available for hire as a consultant. I would LOVE to be your telephone guy! If you’re planning on trying this, then I’m really flattered. Let me know how it goes. Mine has been running for about two years and I cannot tell you how handy it is to have that much CDR data in a MySQL table. I have a PHP script that I use to analyze the data. Do you want to see that? This entry was posted in Avaya, data, pbx on December 11, 2016 by roger. So Avaya may be selling off their contact center business and filing for Chapter 11 protection? What does this mean to Avaya customers? Those of you who had Nortel and later became “Avaya Blue” customers went through this. Siemens ICN kind-of went through this as they changed to “Unify” and were bought a couple times. Cisco has a huge advantage in enterprise telephony. They enjoy a great relationship with the network managers and can price their telephony solutions well under market since much of the infrastructure is already in place. Anyway, some of you readers out there are Avaya customers, and some of you have gone through this before with Nortel. What do you think this means? I loved the Nortel Option 11. This entry was posted in Avaya on November 28, 2016 by roger.